Hostel Cornel is the younger brother of Hostel Costel, with the same funky vibe and character but with a different location - right in the middle of the action. Basically it’s just around the Cornel from the main square – Unirii. And as it is usually the fact the 'younger' brother is a bit bigger - having 50 beds. We aim to host you in the friendliest atmosphere possible and make you experience the most of the city. After 7 years of experience with our previous hostel, as well as our adventures as travelers in hostels all over the world - we know what you want. We love to travel as well! If you are the kind of person who wants to be close to where all the fuss is happening, this is the spot. The Hostel just around the Cornel! 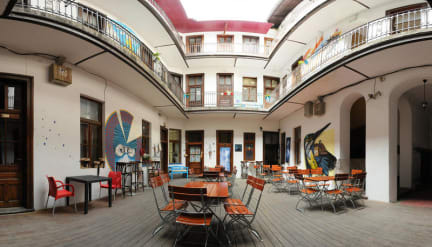 The hostel is located just behind Unirii Square - 150 m to get there. Just across the street there is the Faculty of Arts and the Revolution Museum. The pedestrian area, bar's and pub's area all reachable by basically getting out of the hostel. All the private rooms and the quadruple rooms have their own bathroom, fridge and TV. For the dorms there are 6 toilets and 5 showers, should be more than enough. 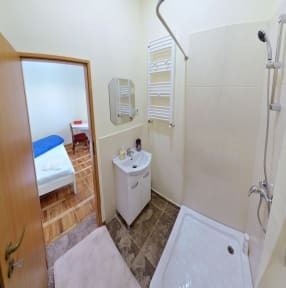 There is a small kitchenette with a big fridge, microwave, toaster, coffee-machine and water heater. There’s free coffee and tea all day. Unfortunately it’s not suited for fancy cooking as there is no stove. All the rooms have fans for really hot summer nights. Of course WiFi is free all over the building. Cancellation policy: 48 h before arrival. Payment upon arrival by cash. This property can pre-authorise your credit card. Guests younger than 18 years can check in only accompanied by a parent/ guardian.